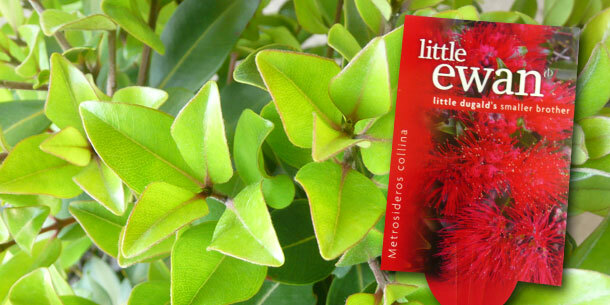 ‘Little Ewan is a low growing and dense evergreen shrub. With a maximum height and width of 1 metre “Little Ewan” is a beautiful compact plant suitable for a sunny spot in the garden or as a pot specimen. Like it’s bigger brother “Little Dugald”, “Little Ewan” is also a heavy flowering Meterosideros displaying masses of bright red nectar laden flowers. This usually occurs from late Spring through to Summer, however spot flowering can occur during others times of the year. “Little Ewan is easy to grow in full sun or part shade in most soil conditions. The plant will tolerate light to moderate frost, coastal conditions, wind and is drought tolerant once established.